Cassidy's Cause is a 501(c)(3) nonprofit organization whose mission is to help individuals grow and develop through recreational activities with horses. It is our mission to provide individuals with disabilities the opportunity to grow and develop through therapeutic, educational and recreational activities, while on a horse. 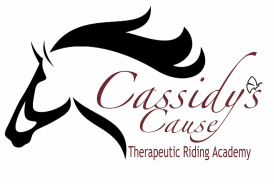 Cassidy’s Cause Therapeutic Riding Academy was an idea conceived by three people who were then involved with an existing therapeutic riding program. These visionaries saw a need in the community for wider service to more challenged riders, and decided to develop a new riding program. The founders were Mike Falconite, Angie Jackson, and Dara Triplett. In May of 2013, a core group of volunteers and founders met and decided to begin a new program. The name, “Cassidy’s Cause Therapeutic Riding Academy”, (CCTRA) was named after Jeff and Dara Triplett’s daughter Cassidy who passed away in 2004 from Tuberous Sclerosis at the age of 9. In June of 2013 CCTRA was accepted into the Professional Association of Therapeutic Horsemanship International (PATH Intl.). The Falconite Family provided a contribution which made it possible to get Cassidy’s Cause off the ground with a new barn and riding facility. We started construction on the new barn July 1, 2013 and it was completed in March 2014. With 7 horses, 3 mini’s, one instructor, and 3 instructors-in-training we were able to begin our first class on Thursday April 15, 2014.